for the emot ional demands o f t he treatmen t .
tistic in comparison to other regions in the world [1-3]. lack of estimations of infertility . infertility (36%), and anovulation (29%) . plained, idiopathic or psychosomatic infertility [12,13]. 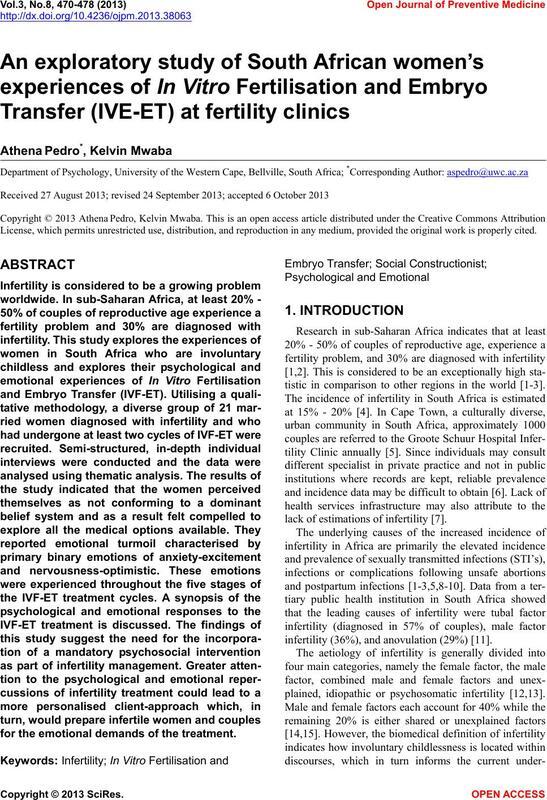 be male factor infertility [1-3,8,17-19]. structured in terviews would be appropriate for the study. questions that they deemed too personal or threatening. Fertilization and Embryo Transfer (IVF-ET) treatment. share their experiences of infertility. placed in a specific file once it had been contextualised. participant was a Christian Indian. choosing to remain childless . through all of this and to find the money to pay for it”. struggle of pursuing a biological baby . some of the comments of the participants. and to us it meant being able to have a baby”. will fall pregnant, I still have another option with IV”. doctor as well as for the biomedical model of treatment. of me. It was unsuccessful”. needed to check the hormone levels”. “I experienced it to be very upsetting and distressing. scribed as a roller coaster of intense emotions. most was the fact that I wasn’t in control of this”. “what ever had to be do ne was worth it”. ovaries so that multiple eggs are produced. expectations of the process, you are never really ready. is all in a schedule worked out for yo u”. through ultrasound scans and blood tests. “All the injections, you r bu ms g e t so so r e , believe me. something wrong to jeopardise it”. needles they were still willing to proceed with treatment. ple are willing to go to in order to achieve a pregnancy. all entails waiting, waiting, waiting ”. nervous with a hint of excitement and anticipation. and you feel so great”. control any wr ong or any risk”. very optimistic about going to the next phase”. procedure in this manner seemed logical and practical. they felt during this phase of the IVF-ET. “You know to tell you the truth I had mixed feelings. work, the next second I felt anxious, nervous, cautious. I couldn’t keep up with the emotional turmoil”. and you literally fall to the bottom of the pit”. know how to feel and that’s mixed emotion”. could strike at a ny m o m ent”. bad experience may be imminent. ticipants described having mixed emotions. ‘I remember having felt just sad or happy or hopeful’. cessful. Its crazy, I know but that was how it was”. are not yourself, your emotions are all over the place. your own baby and you will do anything to get it”. feelings that rapidly change from one extreme to another. felt “nervous-anxious, worried-optimistic all at once”. They described these emotions as being intertwined. as being the worst part of the procedure. is the worst of all”. come as well as an unsuccessful treatment outcome. brate. It really felt good that it worked”. anyone and just want to be left alone”. success of the next cycle. they have exhausted all of the options available to them. and counselling services available at infertility clinics. pose as a source of information and general support. is no conflict of interest of any parties contrib uting to this study. between partners. Unpublished Master’s Dissertation. Science and Medicine, 46, 891-899. 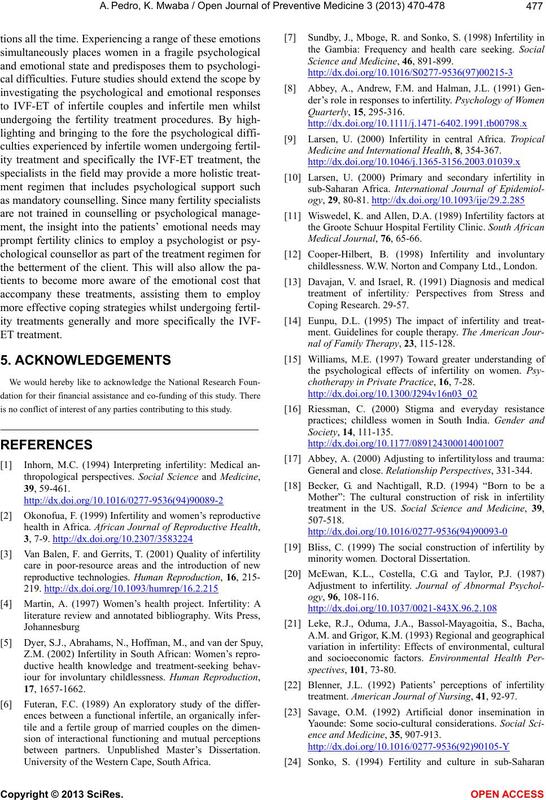 Medicine and International Health, 8, 354-367.
childlessness. W.W. Norton and Company Ltd., London. nal of Family Therapy, 23, 115-128.
chotherapy in Private Practice, 16, 7-28. General and close. Relationship Pers p ectives, 331-344.
treatment. 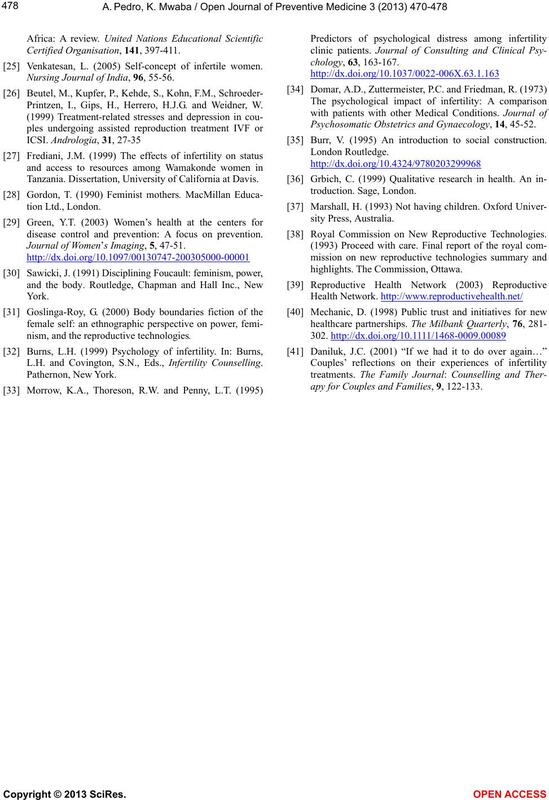 American Journal of Nursing, 41, 92-97.
ence and Medicine, 35, 907-913. 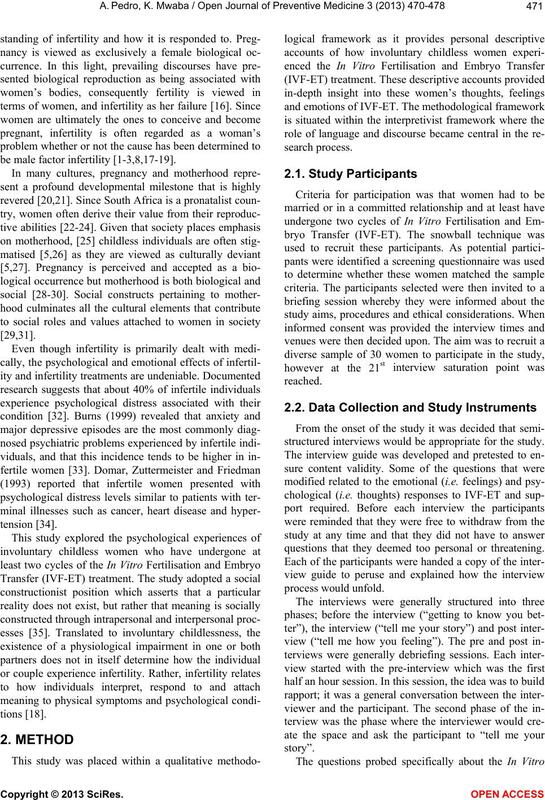 Venkatesan, L. (2005) Self-concept of infertile women. 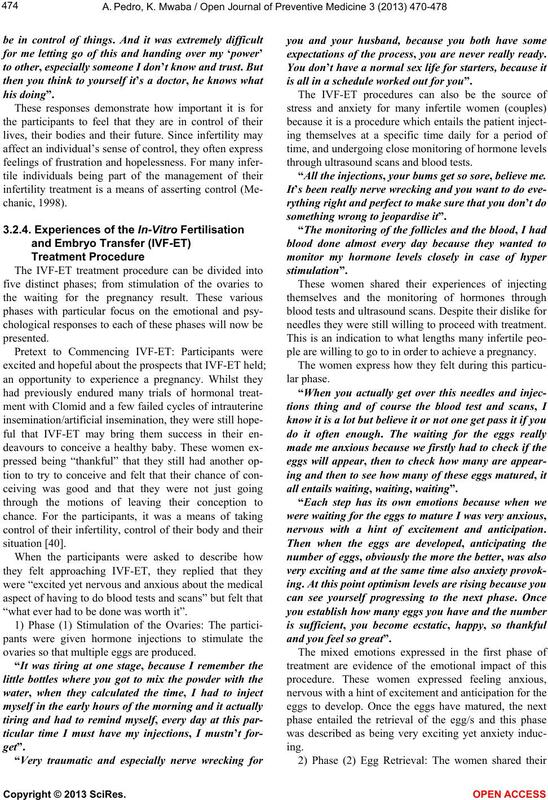 Nursing Journal of India, 96, 55-56. Printzen, I., Gips, H., Herrero, H.J.G. and Weidner, W.
Tanzania. Dissertation, University of California at Davis. disease control and prevention: A focus on prevention. Journal of Women’s Imaging, 5, 47-51.
nism, and the reproductiv e technologies. L.H. 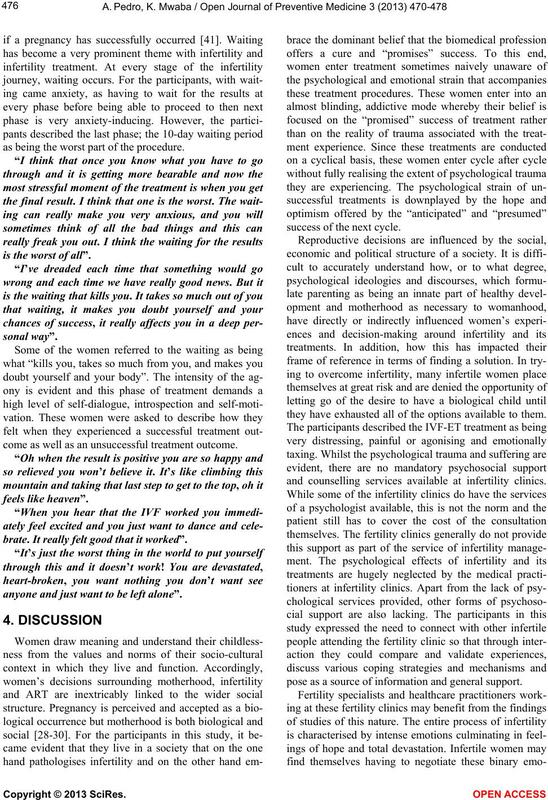 and Covington, S.N., Eds., Infertility Counselling. 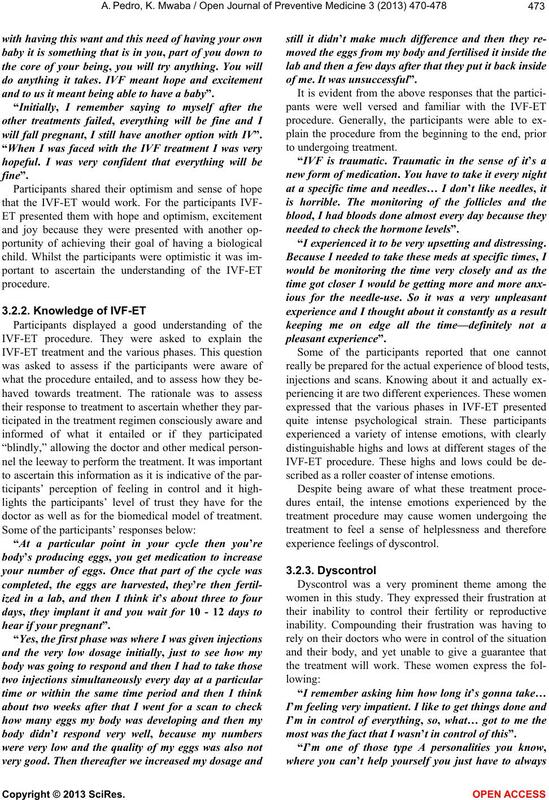 Psychosomatic Ob s tetrics and Gynaecolog y, 14, 45-52. Burr, V. (1995) An introduction to social construction. Royal Commission on New Reproductive Technologies. apy for Couples and Families, 9, 122-133.